With a frame rate of 24 Hz, the IRC-640GE LWIR delivers excellent, noise-free and 640 x 480 resolution images and offers a real-time image correction including background subtraction, an error pixel and shading correction as well as a linearization of temperature value). ** Maintenance-free, uncooled microbolometer sensor, enabling the detection of temperature distinctions of < 80 mK. ** Very easily be installed in existing software, due to its integrated image adjustment and the Gigabit Ethernet (1000Base-T) output. ** Offers a mechanical shutter system which can be adapted to several LWIR lenses. 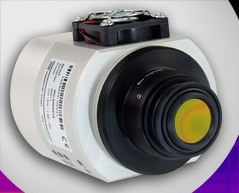 Being robust and very compact, the IRC-640GE LWIR infrared camera is especially suitable for surveillance applications, automation, monitoring of quality and process control as well as for scientific research and development.